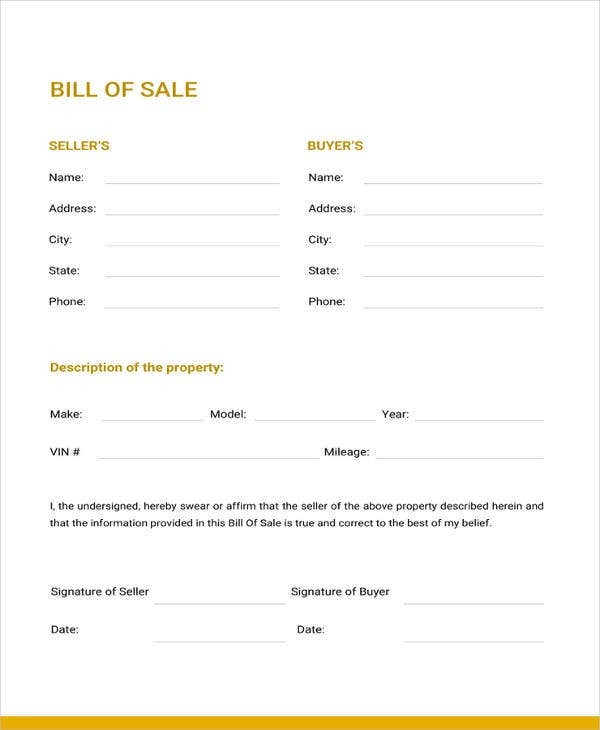 A Generic bill of sale is a legal document which helps in recording the sale or transfer of a property like a vehicle, boat, equipment, etc between two parties. They protect the interests of both seller and the buyer by identifying the condition of the vehicle as well as ensuring payment transaction. 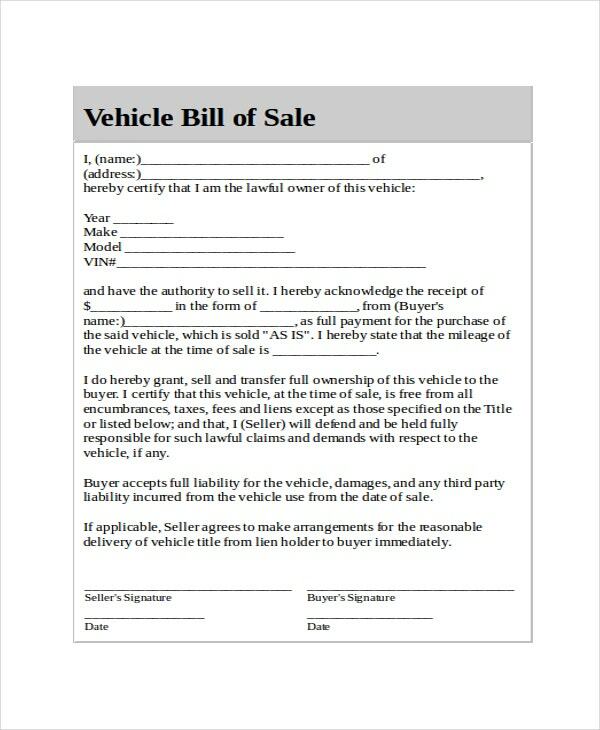 The Bill of Sale Template are used as evidence document which authenticates ownership of the vehicle. 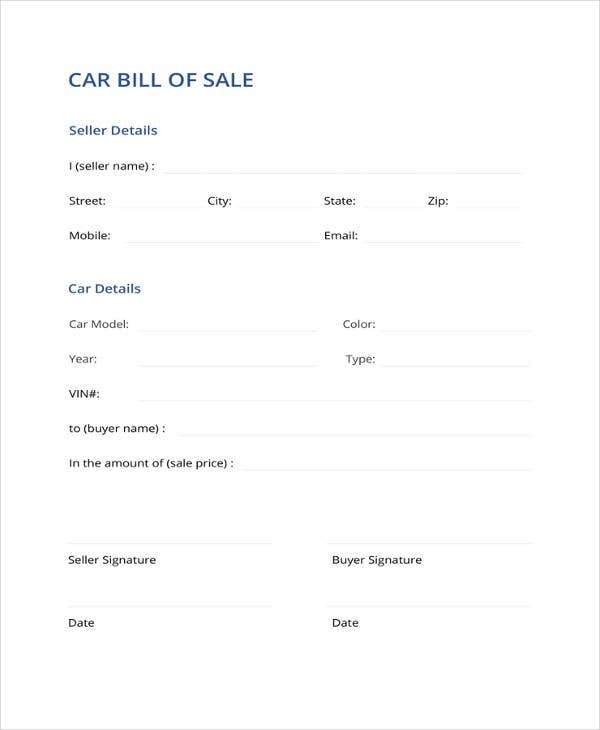 To know more about these templates one can search Google “how to make a bill of sale”, “standard bill of sale”, “car bill of sale printable” or “free printable bill of sale for used car”. 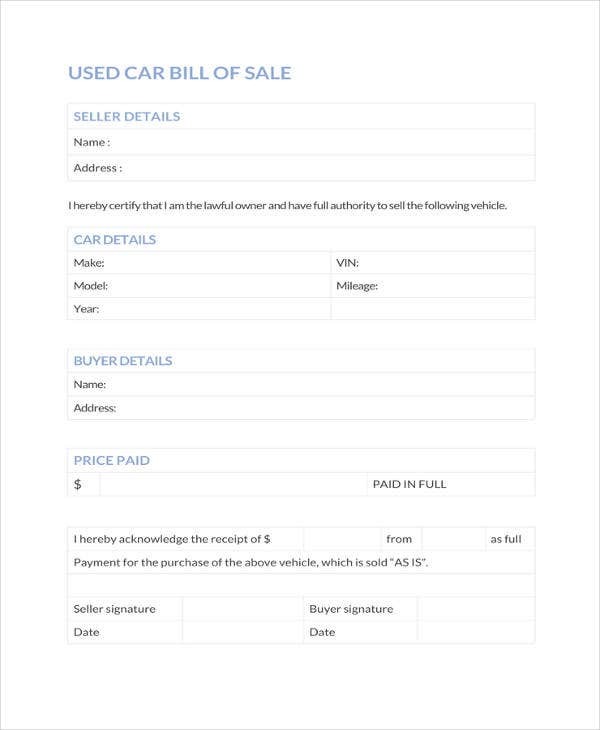 This bill of sale word template mentions the name and address of the seller, the vehicle details like make, model, and year of purchase as well as VIN #. It also endorses the payment received from the buyer. The condition of the vehicle as well as the statement that the vehicle is free from any obligations are mentioned. You may also see Auto Bill of Sale Templates. 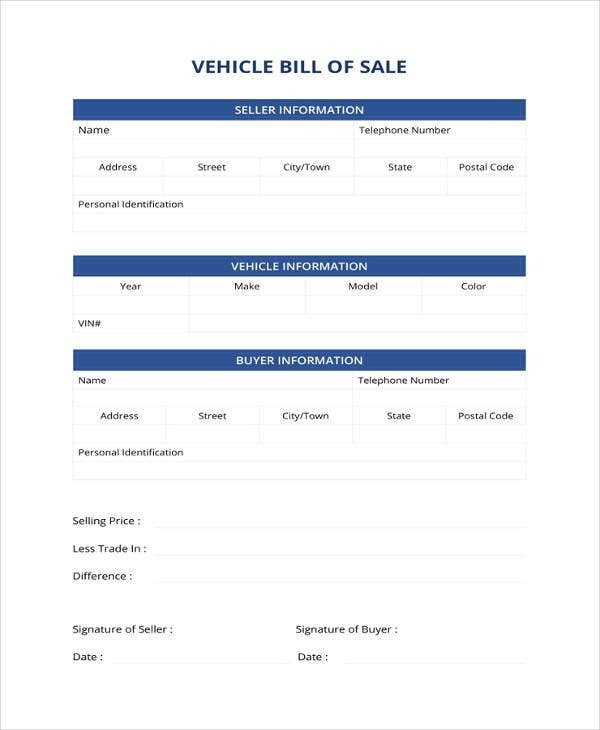 This bill of sale template provides vehicle information like make, model, year of manufacture, style, and color. The seller’s and buyer’s name and address are mentioned along with agreed amount for sale. 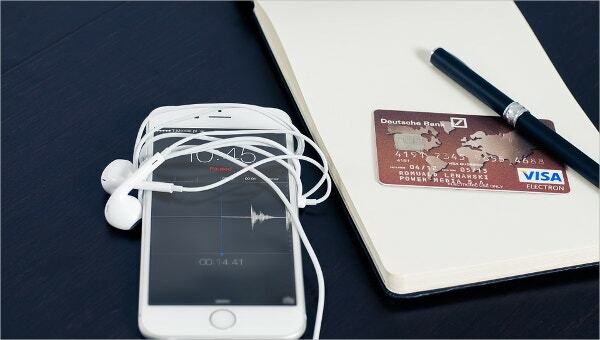 The document provides an option to consider this transaction as a gift. 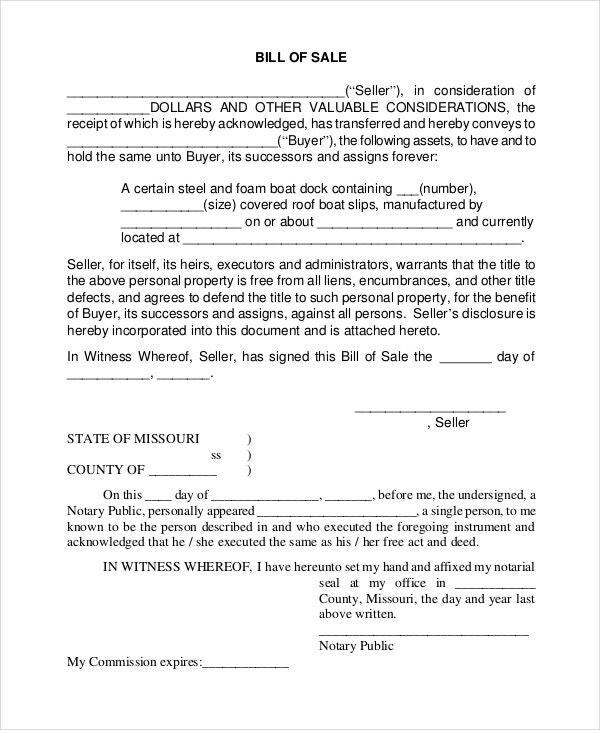 The date of transaction is mentioned and seller’s signature is obtained. 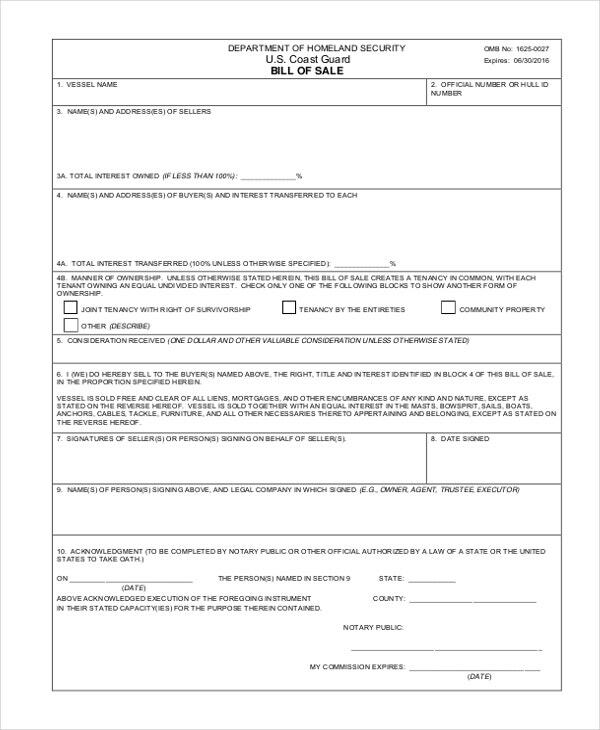 This bill of sale template describes about selling a boat. It provides seller name and the value of the boat agreed for sale. The boat number, its size, and manufacturing details are mentioned. The current location of the boat is also mentioned. The document obtains the signature of the witness and the date of transaction is recorded. 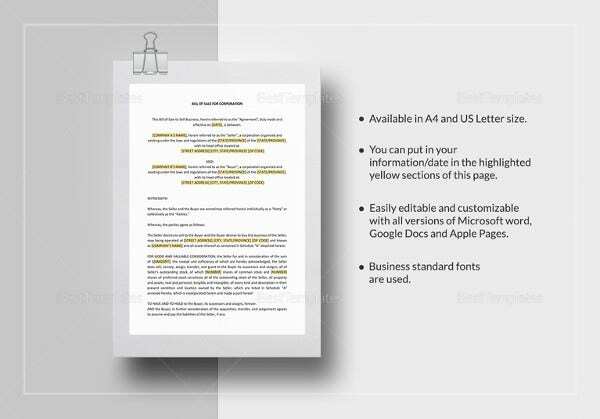 This generic bill of sale template is for multipurpose use. It can be used for selling automobiles, truck, van, heavy trucks, trailers, motorcycles, boat and many more. The buyer and seller names, vehicle details like make, model, year of manufacture and vehicle identification number are mentioned. 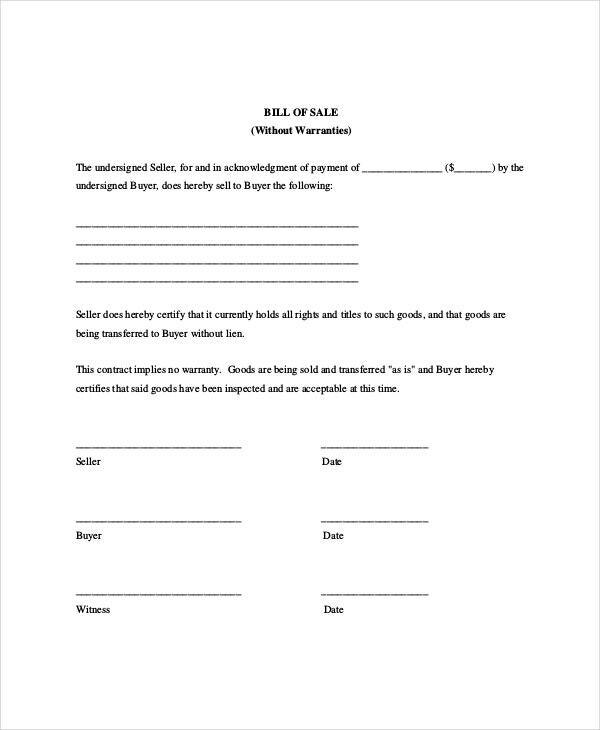 The signature of the seller and the date of transaction are recorded. 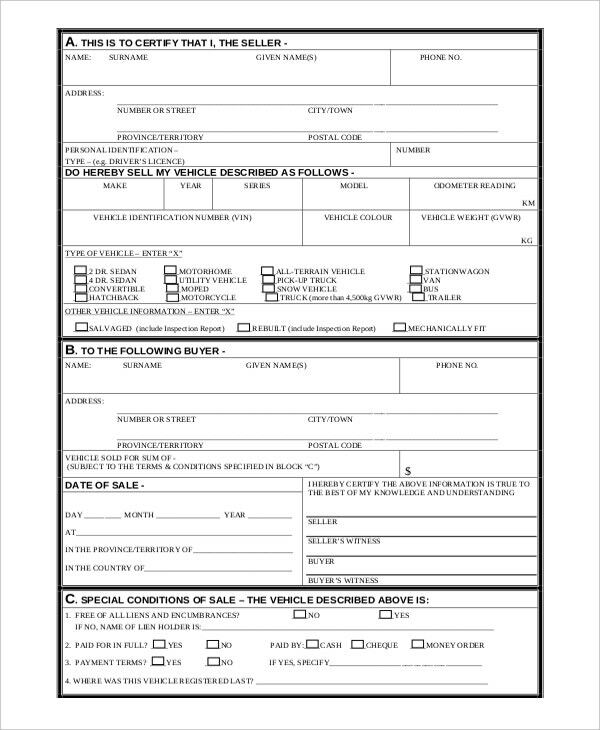 This is generic bill of sale form pdf format which can be used for selling a truck. It provides the name of the seller, contact number and address. The vehicle details like the make, model, series, year of manufacture are mentioned. The buyer name and address as well as the condition of the vehicle are described; sale transaction details are also mentioned. > What is a Generic Bill of Sale? 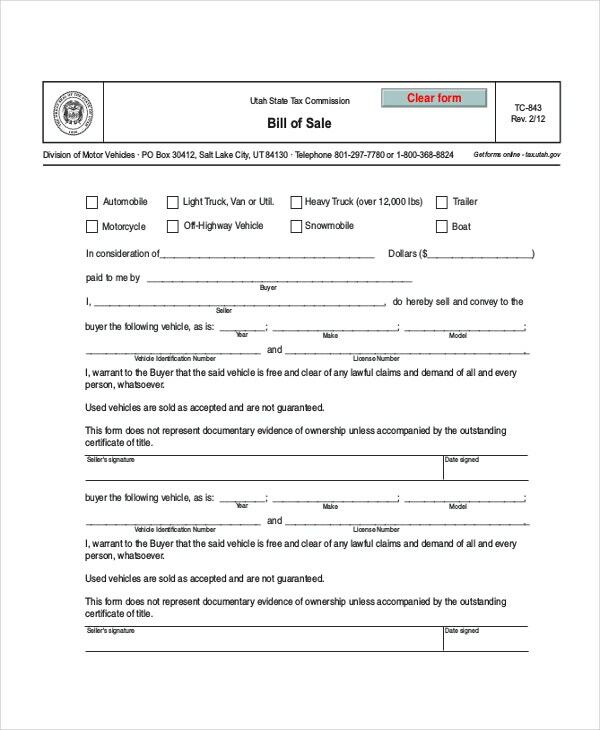 A Generic bill of sale is a legal document that authorizes the sale of a vehicle or a boat. They safeguard the rights of both buyer and the seller from any infringements of the law. They endorse the transfer of property by satisfying certain parameters. They also record the vehicle condition, its make, model, etc to confirm the vehicle. 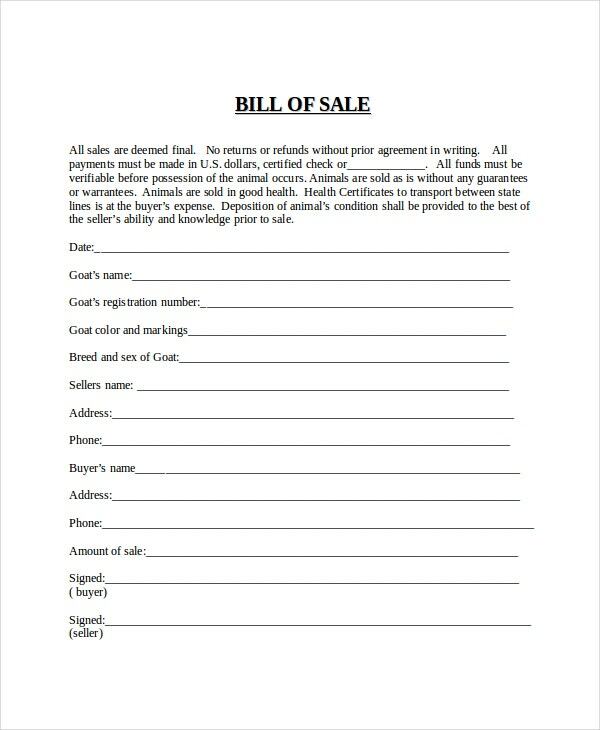 You may also see Gun Bill of Sale Templates. They also approve that the vehicle is free from any legal obligations and the sale is a authenticated one. To know more about their varieties, one can search Google using “free printable bill of sale for used car”, “how to do a bill of sale” or “motorcycle bill of sale”. 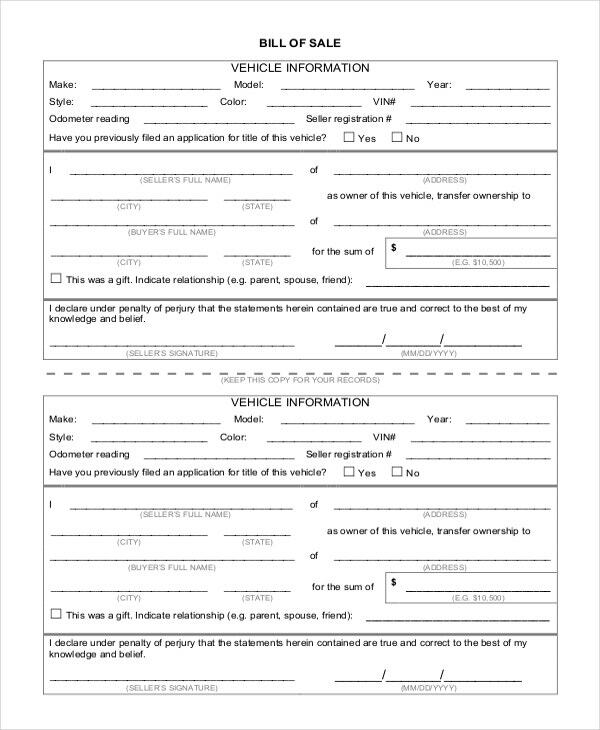 They are the authenticated documents for the sale of vehicles and protect the rights of the buyer as well as the seller. They ensure that the vehicle details are properly recorded and that the vehicle is free from any obligations. The sale transaction and vehicle details recorded are endorsed by the witness and the notary to indicate that the document is legal. They help to know whether any payment loan dues are pending for the vehicle; the registration details of the vehicle are also recorded. They enable quick selling of vehicles and avoid legal hurdles. The main purpose of the generic bill of sale is to ensure smooth and safe transfer or sale of vehicles between the buyer and the seller. They ensure that the vehicle documents like registration, purchase details and vehicle condition are legitimate. They ensure that the agreed payment is made for the sale transaction between the two parties. You may also see Dog Bill of Sale Templates. They also help to make sure that the vehicle is free from any encumbrances. They are a legal document and help in obtaining loan for the vehicle. They endorse various factors like size, shape, the location and year of manufacturing. They are authenticated by the notary which makes them a legal document. Generic bill of sale can also be considered as vehicle bill of sale. It is extensively used when one wants to purchase a used vehicle like a car, truck or trailer. They help in knowing the modalities of the vehicle and ensure safe and swift money transaction through selling. They help to please both the buyer and the seller as well as safeguard them from legalities.